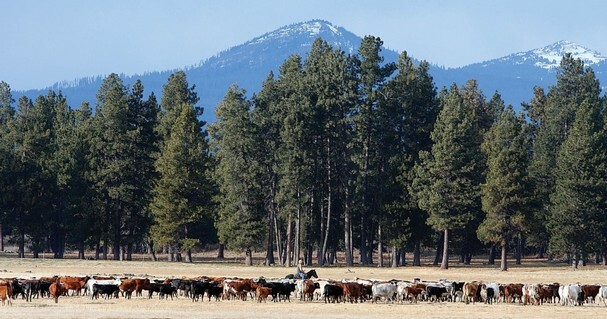 In this Dec. 3, 2007, file photo, a cowboy drives cattle near Fort Klamath, Ore., in the upper Klamath Basin. A deal to share scarce water between ranchers and the Klamath Tribes has cleared another hurdle on its way toward becoming part of a bill in Congress to overcome a century of fighting over water in the Klamath Basin. Parties announced Wednesday they have finished negotiations to overcome last summer's irrigation shut-off to cattle ranches in the upper Klamath Basin after the Klamath Tribes exercised newly awarded senior water rights to protect fish. GRANTS PASS, Ore. — A deal to share scarce water between ranchers and the Klamath Tribes has cleared another hurdle on its way toward becoming part of a bill in Congress to overcome a century of fighting over water in the Klamath Basin. Parties announced Wednesday they have finished negotiations to overcome last summer's irrigation shut-off to cattle ranches in the upper Klamath Basin after the Klamath Tribes exercised newly awarded senior water rights to protect fish. The deal still must be voted on by the tribes and ranchers. If approved, it becomes part of Oregon Democrat Sen. Ron Wyden's effort to pass legislation authorizing removal of four hydroelectric dams on the Klamath River to help struggling salmon, and another that gives farmers on a federal irrigation project greater assurances of water during drought. That legislation has been stalled by House Republicans. "This agreement is nothing short of historic," Gov. John Kitzhaber said in a statement. "On one of the more complex issues facing the state, people committed their time, energy and expertise to come up with solutions that support a stable agricultural economy and healthy fisheries and riparian areas." The parties came together after 30 years of a process known as adjudication to settle water rights in the Sycan, Wood and Williamson rivers, which flow through the former reservation lands of the Klamath Tribes into Upper Klamath Lake, ended with the tribes gaining water rights to time immemorial. The agreement addresses some outstanding issues from that process. When drought hit last year, the tribes and the Klamath Reclamation Project called their senior water rights, forcing watermasters to go to each ranch drawing water from the rivers and telling them they had to stop, turning green pastures to brown. The negotiations could not have been possible without the shut-off, which forced ranchers to sell of their herds or move them, said rancher Becky Hyde. Ranchers face an even tougher year this year, because with drought continuing and another irrigation shut-off likely, many no longer have any cattle to sell, added rancher Andrea Rabe. With a federal drought declaration in place in neighboring California, Klamath County ranchers qualify for federal grants to help them through the hard times, said Richard Whitman, natural resources adviser to the governor. If the deal becomes law, it includes further federal payments to ranchers who fence their stock out of the rivers, and plant trees to help keep water temperatures cool for fish. Reduced water withdrawals by ranchers under the agreement will increase flows into Upper Klamath Lake by 30,000 acre feet, where they will benefit endangered sucker fish that are sacred to the tribes. The water will also be available to the Klamath Reclamation Project, a federal irrigation project straddling the Oregon-California border that has seen irrigation cutbacks during drought to protect suckers and salmon in the Klamath River. Klamath Tribes Chairman Don Gentry said the agreement provides a balance that will benefit the entire region economically. It also offers help for the tribes' efforts to regain control over timberlands they hope will restore an economic foundation for the tribes lost along with their reservation in the 1950s. The cost of the combined agreements goes from a 2007 estimate of $970 million, to $550 million, due in part to increased pledges of funding from Oregon and California, said John Bezdek, special assistant to the secretary of Interior. Jim McCarthy, a spokesman for the conservation group WaterWatch, said the extra water going into the lake was welcome, but not enough to overcome water problems throughout the basin, particularly on the national wildlife refuges that depend on the leftovers from the Klamath Reclamation Project. He added that cost reductions relied on accounting "gimmicks," and remained close to $1 billion for taxpayers.